Understandably, the Slender Man creepypasta has become one of the most popular and widely acknowledged of all time. Well, what’s a creepypasta, you ask? It’s a horror themed story that originates on the wondrous thing that is the internet, and is subsequently copied and retold. For more information on its birth and evolution, check out my post Creepypasta Time: Origins. Can you believe that good ol’ Slender began with a Photoshop contest on a forum? The challenge was rather simple – to create paranormal images. On the tenth of June, 2009, Eric Knudsen, under the pseudonym “Victor Surge” posted his submission with portions of text, depicting quotes from apparent witnesses relating to this unknown entity. His inspirations came in many forms: The Mist by Stephen King, horror video games like Silent Hill and Resident Evil, the works of H. P. Lovecraft, and numerous other media. 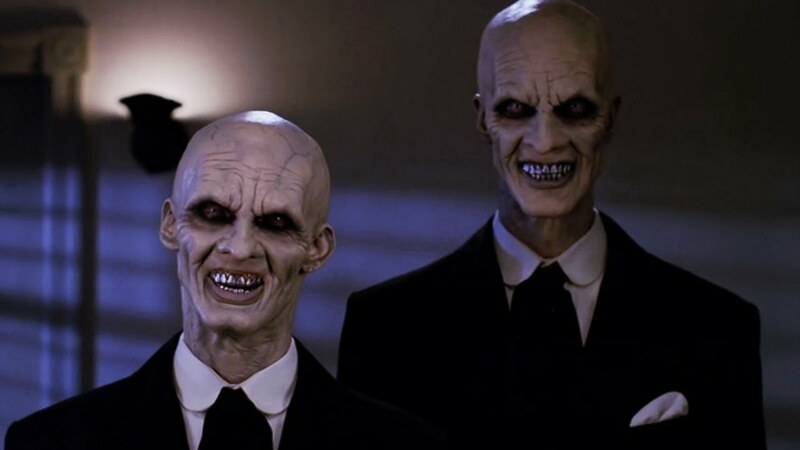 The specific appearance, however, was believed to have been inspired by The Gentlemen that starred in probably the most terrifying Buffy the Vampire Slayer episode, and the DC superhero The Question. There really is something sinister about that faceless face and the impossibly long limbs beneath that fabulously tailored suit. It swiftly inspired others to add to and expand this mysterious, yet horridly alluring fictional character. Soon enough, a wide array of writing, fanart and even cosplay erupted across the darkest of forums. a film adaptation was released in 2015. I, for one, highly recommend this masterpiece. In 2012, the very first Slender video game took computer screens by storm. Within its first month, the game was downloaded over two million times. Since then, a tremendous amount of games have been dedicated to the Slender mythos. Even now in 2018, a subsidiary of Sony Pictures partnered with Mythology Entertainment to bring the wonders of Slender to theatres, which will release in August. Check your calendars for that, people! Of course, with every new storyteller Slender’s intentions, abilities, habits and even his image vary. In some cases, he only targets children, whilst in others he inflicts insanity in his adult prey. One thing’s for darn sure though, Slender has brought horror lovers together over the years, and will continue to do so. We all know Slender Man is fictional, right? Well, for others, the line that separates the fictional from reality is unbelievably blurred. In 2014, two twelve year old girls brutally murdered their classmate, stabbing her nineteen times. They both stated that they were afraid that Slender would have killed their families had they not went through with the act. Apparently they wished to become proxies for him, but instead of succeeding in their goal, they are now spending their lives in prison. Has Slender wormed his way into your mind? Maybe not yet… But soon.